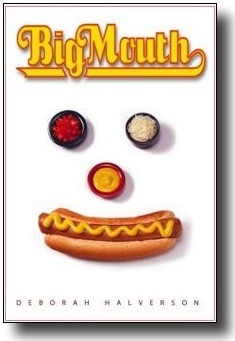 Horn Book Guide Gives BIG MOUTH a Thumbs Up! “(3) Fourteen year old Shermie Thuff dreams of being a competitive eater. Since champion eaters are thin, he enlists help from his friend, Gardo, who coaches Shermie in the quick weight-loss methods he uses as a wrestler. In this cautionary tale about food-obsessed boys with eating disorders, Halverson uses humor and a light touch to explore a serious, little-discussed issue. DE. Congrats Debbie! This is great news! Yay!!! I used to get this magazine when I was teaching and loved it. You’ll get a lot of exposure! Time to start on #3. Congratulations Debbie! WHOO HOO way to go!